(Courtesy photo) Funk pioneers George Clinton & Parliament Funkadelic will be playing at The Depot in Salt Lake City on Friday, Dec. 30. 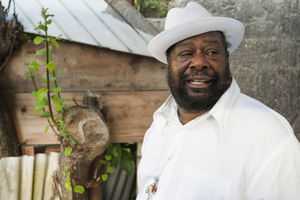 Funk pioneer George Clinton is playing The Depot in Salt Lake City on Friday night. His phone interview with The Salt Lake Tribune touched upon the state of funk, his upcoming Parliament and solo albums, the music that inspires him, his songwriting process, and what the future holds for him. You're considered the godfather, president and CEO of funk music, so how do you view the state of the genre now as we're headed into 2017? I think you've got a lot of inspiration, a lot of funk now — it reminds me a lot of the late, late 1960s. You got a good environment for funk music right now. You can see a lot of it is showing up, with Kendrick Lamar, "Uptown Funk," and — what's his name? — Bruno Mars, [Childish] Gambino, Flying Lotus. You got a lot of people ready to do it, you got a lot of rock bands getting into funk, you know what I'm saying? It's a good environment to create some late-'60s, early-'70s type funk. You got a lot of bulls--- going on in the world, and whenever that's happening, people are needing to dance their way out of the bulls---. Any of those in particular you see carrying the torch of funk into the future? The people I just mentioned, all of them is dabbling in it. Kendrick Lamar is really successful at doing jazz and hip-hop funk. You got a lot of bands coming in — Flying Lotus, Thundercat and all of that, Bilal. You got a lot of people that been around awhile, but getting ready to just let go — they see a valid atmosphere for it. Oh, hell no! I got a fresh batch! I got grandkids and their friends in the group, I got them interested. So they're taking me right back in with all these young hip-hoppers, with the Atlanta sound, and we mix it all with the band — the hip-hop sound and the live tracks all together. We can do it all! I've read that you have a solo album and another Parliament album coming out as well sometime in the near future. What can you tell me about those? The Parliament album, I'm gonna release it in parts, so it's gonna be two parts or three parts. I got a lot of music, and I don't wanna put it all on one record, so I think I might just give it to 'em in three parts and make it cheap. They'll still get a lot of funk, but it'll be the same album in three parts, like a couple of months apart. It takes people a long time to absorb funk, and I can't do no Snapchat funkin'! If I'm gonna funk on Periscope, I got to get into it! I respect the fact that today's is a shorter attention span, so I'm trying to service that. And they can chop it up the way they want to later, but I have to give it to 'em the way I do it. So, what about the solo album? I'm doing a record with Flying Lotus on Brainfeeder, and I'm thinking that's probably gonna be a George Clinton solo album. Can you articulate to people what the sonic and musical differences are between a George Clinton album, a Parliament album and a Funkadelic album? Well, basically, Parliament is, you know, mostly horn parts and elaborate voicing arranged production-wise. Funkadelic is mostly — when you do differentiate it, it'll be because of the guitars and the rock 'n' roll sound part of it. And George Clinton, we'll just do whatever I like! I'll let somebody else mostly produce me, or produce it with me, and I'll pretty much be under their influence, whatever that might be. That's what I'm thinking about doing with George Clinton. I'll be standing in a specific direction — not just do what I do, but what somebody might think I should do or could do. Like the way you'd work with Prince. While you're most associated with funk, of course, I've read that you're actually a huge fan of music in general. Who are some artists or bands you like that might surprise people? OK … what may surprise people is Alabama Shakes. People pretty much know that I like good music. Country music, I respect them 'cause I'm a songwriter first, and so when you're a songwriter, you like a song regardless of if you'd even be the one to sing it; you respect the fact that it's cleverly written. We used to call it a "Hail Mary" in Motown — if you'd just luck up on a record. I like songs. Gospel music. The music that I've liked, like doo-wop music from the '50s, and real gospel music … I'm really liking jazz more as I've gotten older. The kids have finally found a way to make it work in top-40 music, like Kendrick Lamar's album — that's like far-out jazz, but finally they found something else to use other than sampling James Brown or P-Funk, or R&B. They found a way to get these young musicians a chance to play on something. And it sounds like a sample, 'cause they play so far-out anyway. So hip-hop is growing up now. You're getting jazz and classical in hip-hop now. It is a valid music. Punk rock music — I'm from the era of Iggy Pop and MC5, so a lot of people might not know that's been a part of our repertoire for years. I was able to relate to [Red Hot] Chili Peppers and what they were doing. '60s rock and roll — Emerson, Lake & Palmer, King Crimson … Mambo! I tell you, that's one thing nobody might guess. Some of my favorite music of all time is mambo — Tito Puente and all that stuff in the '50s. And "Oye Como Va" that Santana did — I knew that one by Tito Puente in '56! It was No. 1 on the R&B station! On the other side was "Coco Seco," which is one of the songs I'm planning on doing, hopefully soon. You mentioned that you're first and foremost a songwriter; you started off in a doo-wop band, you moved on to a more psychedelic sound as the years went on — is a shift like that an easy transition for you to make, or do you really have to try to occupy a different headspace to get that to work? Doing it from a songwriter standpoint, you ain't gonna be sold on what you think your style is or your bag is; you can just flow with what's getting ready to happen by watching the kids that's up under you coming along and see where they're trying to take stuff. So you're a little ahead of yourself by paying attention to them; before they push you out because you're too old, you learn to like 'em. When they first start doing the stuff, it sound really corny to you as a grown-up, [but you] realize it only sound that way because it's threatening. You know that that's getting ready to be the next s---! So if you act quick, you can be on top of 'em without copying them — you can be a part of what they're trying to do. When we saw hip-hop coming along in '79, '80, we did "Atomic Dog" immediately, which was the ingredients of what we saw hip-hop turning into — with sample sounds and live sounds mixed. Without even rapping, "Atomic Dog" was like intentionally a track for that style and that audience. Even though it was accidentally done on my part, as far as the lyrics are concerned, the track, we was intending for it to be something like what we had heard from Rakim in the early hip-hop out of the Bronx, before they even got hit records. The issues that you've had with your royalties and your back catalogue are kind of well-documented; conversely, earlier, you expressed a real enthusiasm for making new music. Would you still be making new music and going out and touring if you didn't have those issues with your catalogue? The album that we have out right now that's really hot, with Ice Cube, and Kendrick Lamar, Sly Stone, the album that we have out right, with three records set [to come out], that's why we're working so much right now — we're hotter than we've ever been! There's 33 new songs that's on this album, "Shake the Gate." That's what we're doing, that's what got us so hot right now! I was on the Kendrick Lamar album, "To Pimp a Butterfly." So yeah, we're making new music! Doing a Parliament album like I just said — doing Parliament and a George Clinton. So, yes, I'm making new music. I'm doing a documentary on that copyright stuff that you talking about. We got some of the songs back, recaptured, but we're going after the recapturing of all the songs. But we're still doing a documentary on that to expose what's really going on with all those songs. It's still the most unbelievable story in the history of the music business! You've heard about the book? [the 2014 autobiography "Brothas Be, Yo Like George, Ain't That Funkin' Kinda Hard on You?"] … All of that has been documented in a documentary form. It's unbelievable. I paid a million, six hundred thousand to pay the debt off Funkadelic "One Nation Under a Groove" and "Knee Deep," 'cause all of that was in jeopardy for the last three or four years. I need another $40,000 to pay that off, and I'll have that back in my possession. And then this documentary will come out. What does the future hold for you? How long do you plan to keep going on doing new music, going out touring? Do you have any plans to stop at any point? Not yet, not just yet! I may clone myself one more time and keep it going! I'm inspired, like I said, fighting for the rights to that music; with the Mothership going into the Smithsonian, it gives us the right energy to fight for that music. And that's what inspired me to do all these new songs and regroup the revamped group. I'm inspired like never before. You're gonna be in Salt Lake City on Dec. 30. Can you give our readers a sense of what your show is gonna be like? I can tell you it's gonna be like a Funkadelic show like you've never seen before. Check the YouTube and our website and see some of the shows we've been doing in Hong Kong and Tokyo and places like that, and Amsterdam, and you can see what the show is gonna be about. It's brand new and hard to explain, as usual! Lots of energy! It's surely a memorable experience for anyone who sees a George Clinton show; do you have any memorable experiences from Salt Lake City, given that it's not a place many would associate with funk music? Yeah, we've played there lots of times! … Also Park City, we've played up there a lot! And Salt Lake City, we've been playing there since the Mothership days! … Tell 'em when they come to the show to bring two booties!